The ship is sinking. The ship is sinking. This is one of my favorite songs, though probably not one of my favorite Tom Waits songs. Fantastic lyrics after the jump. Sadly, every word of the song is true, even "the" and "a." Are National Philosophical Associations Still Useful After All These Years? Back before specialized philosophy gatherings, sub-disciplinary organizations, and the Internet, every country had a philosophical association. People travelled to their meetings once a year or so, gave papers, got to know each other, sometimes formed groups to lobby government. Generally, these associations promoted networking and mutual knowledge. They published journals. They honoured prominent philosophers by electing them to high office. They defined a community. My question is: what functions do these associations serve now? We've had wonderful discussions here lately on philosophy, physics, and metaphysics. The "physics" in question is quantum and relativity physics, AFAICT. So I'd like to ask whether and / or to what extent the sort of "meso-physics" of dynamical systems theory (DST) is discussed in either philosophy of physics and / or analytic metaphysics. I have a number of reasons to ask about DST and metaphysics. There's a school of thought that sees DST as one of the sciences (or perphaps better, one of the scientific tools) that Deleuze targets in his metaphysics. The pioneers here are Brian Massumi and Manuel DeLanda (see here as well) and a number of others including Jeff Bell and Miguel de Beistegui have followed them, as have I.
I'm going to put this post in the "analytic - continental divide (and its overcoming)" category, because I think / hope there's a way adding Deleuze to the mix of a "post-divide" metaphysics would be very interesting, as Jeff Bell has argued in a number of his excellent "Continental Connections Thursday" posts. I have been mulling Brian Weatherson's interesting reflections on why it is so hard to reduce game theory to decision theory. As Brian rightly notes much of decision theory doesn't get off the ground without the probabilities of possible outcomes. (As some of my regular readers on economics know this relates to my embrace of genuine Knightian uncertainty and informs my hostility to philosophers' fondness for decision theory.) But, as Brian points out, game theory is not like that. Now what I found particularly interesting is how Brian frames game theory as a species of epistemology. (He is not the first to do so, but for some reason his remarks hit home.) The key insight (among lots of fascinating ideas) is Brian's observation that "what we’re trying to do here is solve for what rationality requires the players credences to be, given some relatively weak looking constraints." If I understand Brian correctly, game theory becomes a kind of discovery mechanism (of these credences) given certain constraints and assumptions. Now, I tend to think of these (rationality) assumptions, however minimal, as a normative ideal that is, in fact, only instantiated under rather rare social institutions. This is no reason for despair. It means that game theory can be a wider epistemic tool, even in the context of multiple equilibria, or none. For once we can specify what the credences would have been under ideal conditions, deviations from the norm may also be informative if, that is, we have a way of thinking about social causes. What I hope to do in the future is connect this tentative suggestions to some of the very interesting studies (including those by philosophers like Anna Alexandrova, Till Grüne-Yanoff, and Francesco Guala) on the application of game theory in the engineering of policy. When it comes to how much physics, or science in general, we need to know to ground our philosophy, there's a sense in which *none* of us know enough. I've been to conferences where folk I regard as some of the very best philosophers of physics in the world have been treated with, at best condescension, at worst, open contempt by (in one case, Nobel prize winning) physicists. We can never learn as much physics as the physicists because we have to learn philosophy as well and as Jason Turner has pointed out, we have lives, families, comics to buy, ambient doom metal to listen to ... So we learn enough to get a grip on the issues and say what we want to say, knowing of course that as in every area of philosophy, there's always a good chance that someone will come along with a 'I think you'll find ...' referee's report/review/discussion note. *But* what lay behind that opening chapter of Ladyman and Ross, I think, was the sense of frustration with certain colleagues, some of them esteemed colleagues, who haven't seemed to even make the effort to drag their knowledge past Newton, much less into the 20th century and yet seemed to think they knew enough to make the sort of pronouncements about how the world is that L&R cite. Having said that, I am uncomfortable with the insistence that all metaphysics should be grounded in or touch base with current physics. Jenny Saul and I (Magical Ersatz) are very proud to introduce a new project we’ve been working on: Disabled Philosophers. Though we’re using a blog format, this isn’t a traditional blog. We won’t have posts on a wide variety of topics, and we won’t host discussion. What we’ll do is create a space where we can learn about disabled philosophers – sometimes who they are (though we welcome anonymous contributions), sometimes a little about their experiences of being a philosopher with a disability, sometimes both. So if you’re a disabled philosopher, please do get in touch. We’d also love to hear from you if you’re a philosopher who loves someone who’s disabled – your partner, your child, etc. Caregiver and partner experiences are a huge part of understanding disability, and philosophers who are caregivers or partners of disabled people give us an important perspective on the interaction between disability and philosophy. So please do write to us – whether you’re yourself disabled or your daily life is affected by disability because of who you care about. And if, at this point, you’re wondering why on earth you’d want to tell strangers about your experience of disability, we have some reasons for you. We hope you find them persuasive. Breivik’s anti-feminism and Islamophobic rage, his conviction that “multiculturalism” and “political correctness” are destroying civilization, and must be stopped -- all of this is the usual stuff of contemporary resentment.... But there turns out to be more to Breivik’s text than the usual hateful boilerplate. The killer was also a perverse sort of public intellectual. Historically, we owe some of the most exciting scientific discoveries to the rigorous interaction between reductionism and its opposite. In the ancient world, the atomists made great strides by attempting to demonstrate how various ordinary phenomena—colour perception, moral values—could be reduced to the shape and movement of atoms. But atomism fell to an extraordinary theoretical insight of Aristotle’s. For as the great geneticist Max Delbrück once wrote in a sparkling little essay entitled “Aristotle totle totle,” this great philosopher and student of nature pointed out that it is a “fundamental aspect of Nature that human beings beget human beings, and do not beget rabbits or an ear of corn.” The atomists cannot explain this. Delbrück particularly appreciated that this “wonderful man” had posited form as the cause of reproduction (“and not a mini-man”), and impishly attributed to him the discovery of DNA. He was wrong, of course: because Aristotle had abandoned the atomists’ bottom-up compositional principle, and had thus actually blocked the road to the double helix. In the last century, the study of the mind underwent a similar sequence. Why is co-authoring rare in philosophy? My sister is now finishing her PhD in medium-energy nuclear physics. Over the past 3.5 years that she has been involved in this research, she has never written a single-authored paper. Indeed, of most of the papers she collaborated on she is not first author, but one of about 10 or so members of her lab. In the sciences, this is a fairly modest number of co-authors, since papers with 50 or even 100 and more authors are not exceptional (the trend towards huge numbers of co-authors, however, seems to be leveling off). So we can say that co-authoring is the norm in physics, indeed in most of the sciences. I am not aware of quantitative analyses, but philosophy, like other humanity, is still mainly a single-author enterprise (in the interest of full disclosure: I do tend to co-author most of my work). A quick glance at the latest entries in PhilPapers shows that the majority of papers in professional philosophy journals is written by single authors: of the first 100 entries of the New Papers section, only 15 are by two or more authors. I think co-authoring is on the rise in philosophy, but there is still a lot of resistance to the practice. During the court case of a photographer whose work was used by Agence France Presse without permission, a famous philosopher is mentioned. Full transcript here. THE COURT: It was Bertrand Russell who said you shouldn't follow the multitude into evil. Remember that? MR. KAUFMAN: Unfortunately, I don’t read enough of Bertrand Russell. THE COURT: He was one of the greatest philosophers of the 20th century. MR. KAUFMAN: I know who was, but — I certainly know who Bertrand Russell was. THE COURT: It is worth the read. MR. KAUFMAN: Yes, your Honor. By the way, the author at Photo Business Forum was quite wrong. The judge (as you might guess even from the excerpt above) ruled against AFP on almost all matters pertaining to copyright. While the poor and middle class fight for us in Afghanistan, and while most Americans struggle to make ends meet, we mega-rich continue to get our extraordinary tax breaks. Some of us are investment managers who earn billions from our daily labors but are allowed to classify our income as “carried interest,” thereby getting a bargain 15 percent tax rate. (...) These and other blessings are showered upon us by legislators in Washington who feel compelled to protect us, much as if we were spotted owls or some other endangered species. I had a post a while ago on the 'distaste for the working poor' which seems so popular among certain segments of the elite in the US. It's good to read something going in the opposite direction for a change. Any additional thoughts from people more 'in the know'? Is Philosophy of Physics always history of Physics? Steven French suggests, yes. Steve gives two reasons: i) it's so hard to keep up with 'the cutting edge'; ii) unless we're doing something semi-sociological, there are good reasons not to go there [the cutting edge]. Readers comments welcome. Sometimes the fantasy and passion are directed at humane ends, but there will always be politicians that will promote and exploit our worst instincts. Sometimes, when there are external threats (or worse, nuclear annihilation) or crises that focus the minds unifying leaders that inspire us all can rise to the occasion. But there is no law of necessity that one will. None of this is to deny that we shouldn't hope for wisdom and luck in our politicians and the people that elect them; we can also certainly tinker with our institutions to prevent excessively bad outcomes. Lucky are those who live in communities with lots of mutual trust--this is often the product of deep institutional patters (rule of law, women's education, self-government, civil society, empowering religions, etc). But nostalgia, which anesthetizes the mind, has a tendency to make us blind to the real threats we face. End of rant. During the (ongoing?) methodological discussion about physics and metaphysics, Robert Williams stated, "I tentatively suggest that some of the gestalt of "but they're saying p! they should know that's false!" that bugs people isn't that ~p is clearly argued for in obvious places one should know, but that p is part of the folklore, and so the sort of thing folks are used to taking for granted." In many ways this gets to the sociological nub of things. Often p is needed to get a shared research project off the ground and, thus, make progress possible. By the time outsiders are aware of p, it may be deeply embedded and almost invisible to niche-insiders and outsiders alike. (This is a phenomenon that goes well beyond philosophy, of course. David Hume pointed to something like this when he complained that rarely are unmasking philosophers around when a prophect captures popular imagination.) Now, sometimes p is a hard won result, but sometimes it is product of contingent factors (as Dave Baker points out with a generous reference to a book by the much missed Cushing). UPDATE: I've changed the term used to describe the fourth category in the taxonomy below from 'conceptual analysis' to 'conceptual reflection'. I hope the new term is better able to cover the many approaches suggested by commenters which did not seem to fit the original description in a straighforward way. In light of the very interesting methodological discussions we’ve been having here at New APPS on the relations between physics and metaphysics, I’d like to put forward a tentative taxonomy of different strands within philosophical methodology. I suspect it can also be useful for discussions on the analytic vs. continental divide and its overcoming, which is also a recurrent theme in this blog. Formal methods – these correspond to applications of mathematical and logical tools for the investigation of philosophical issues. As examples one could cite the development of possible world semantics for the analysis of the concepts of necessity and possibility, applications of the Bayesian framework to issues in epistemology (giving rise to so-called formal epistemology), Carnapian explication, and many others. Historical methods – they rely on the assumption that, to attain a better understanding of a given philosophical concept/problem, it is useful (or even indispensable) to trace its historical origins in philosophical theorizing. Of course, the study of the history of philosophy has intrinsic value as such (emphasis on ‘history’) but at this point I’m interested in what Eric Schliesser has once described as ‘instrumental history of philosophy’ (emphasis on ‘philosophy’). Empirical methods – these are the methodological approaches that systematically bring in elements from empirical sciences, such as the sciences of the mind (particularly relevant for philosophy of mind, epistemology, but to my mind also for philosophy of logic and mathematics), physics (possibly relevant for metaphysics), biology (arguably relevant for ethics, and everywhere else where evolutionary concepts come into play) etc. Sometimes this approach is described as ‘naturalistic’, but as we know there are (too?) many variations of the concept of naturalistic philosophy (many self-described naturalistic approaches are not sufficiently empirically-informed to my taste). Conceptual reflection – arguably the most traditional philosophical method, consisting in unpacking concepts and drawing implications, introducing new and hopefully useful concepts, problems, conceptual frameworks etc. So we seem to have a plurality of methods actually being used for philosophical theorizing. Are they all equally legitimate and adequate, both in general and in specific cases? I submit that the correct response to this plurality is methodological pluralism. The announcer's call is deeply embedded in my experience of the race (I saw it live on TV and heard the call then). I don't know why, but it's very affecting for me when the announcer, Chic Anderson, says "He is moving like a tremendous machine!" I've never been able to figure out why it's so moving. I don't think it's just nostalgia; I remember being strongly moved at the time. Maybe it's the strange mixing of categories -- we love the personality, the courage, the pride and swagger of race horses, all things to which we can relate (and not in some crude "anthropomorphism," for we are not "projecting" pride onto a race horse, we are recognizing it) and then the "machine" remark pops up. Is it that Secretariat was so dominant it's as if the other poor beasts were running against a machine? Or maybe it's just the awe-struck tone in Anderson's voice that works; the semantic content is, if not irrelevant, perhaps secondary? *I recognize that powerful ethical arguments can be made against horse racing, or at least in favor of drastic reform of many of its practices. Recent comments on this blog have made me realise how viscerally opposed I am to Canadian nationalism--the protection of Canadian jobs against qualified non-Canadian applicants, and of Canadian culture on radio and TV. It reminds me of union featherbedding on a grand scale. But as a person of Indian origin, I am proud of Gandhi and the Indian National Congress. This has led me to wonder when nationalism is morally permissible. Nations are, I take it, groups of people historically united by culture, political organization, and language, and who constitute a significant majority in a geographical area. The majority criterion is important: Jews have shared culture, but they are not a nation, except in Israel. Nationalism is an exclusionary ideology adopted by such a group. It aims to reserve political participation, economic opportunities, and cultural liberty for members of the group. Minority rights movements may ask for some of these things, but they are not nationalisms because they are not conducted by nations. Is nationalism ever morally justified? Is it ever right to adopt an ideology that encourages the exclusion of people? Is it ever right for a majority to do so? Well, it can be right when either it reacts to the colonial subjugation of a nation, or when it attempts to preserve the shared culture against an imminent threat. For example, Indian nationalism was morally justified during British rule. It isn’t justified any more, and has fortunately ceased to exist (I think) having been replaced by provincial nationalisms that have very little justification (though occasionally a modicum). Quebec nationalism was justified when the French language was under threat in North America. It is putrefying now (and enjoying it). There are many other examples of this sort. Some departments in HPS require a MA in an adjoining field in order to get a PhD. A lot of philosophers of X (PoX) fit this bill. It is worth asking if besides genuine competence in modal logic and set theory (perhaps probability theory), PhDs in metaphysics shouldn't obtain a MA in physics (or some other science). This would undoubtedly come at a cost (history, alas? ), or it would lengthen the PhD program against the deplorable (!) world-wide trend of shortening PhDs. Even if the opportunity-costs were manageable, I am not sure if text-book knowledge of some science would really solve some of the deepest problems. Co-author with a scientist or PoXer. While co-authoring seems to be quite normal in metaphysics (and I think this is a great trend), co-authoring with non philosophers or PoXers seems still surprisingly rare within metaphysics (I think). It is far more common in philosophy of mind, philosophy of biology, X-phi, moral psychology, bio-ethics, and maybe a few other areas (some philosophers of economics also team up with economists). Cultivate reliable sources within an other discipline. During the last decade I have almost daily email with three economists (and a wider circle of economists, including historians and methodologists that I pester much less frequently); they ask me about philosophy, I ask them about economics. [At one point I corresponded with Milton Friedman.] Surprisingly enough, in the beginning the economists taught me a lot of philosophy; more recently I have started to teach them a bit of economics. Sometimes our research converges, other times not. They always treated me as if I knew more than I did (thank God for Wikipedia & Jstor! ), and I always asked focused questions. It's an amazing, ongoing learning experience. The first is Laruelle's prose style, which is generally abominable.... to compile the chapter summaries above was never a pleasurable experience for this reviewer, and was often a downright painful one. Laruelle will get away with it only if he can prove that the payoff is sufficient to warrant the effort. The second obstacle is the remarkable arrogance with which Laruelle's theory is presented. Badiou raised eyebrows when, in his Author's Preface to the English version of Being and Event, he told us that this is a great book destined to be read throughout the centuries. But at least Badiou made room for numerous peers in the kingdom: authors of other great past and future books destined to be read alongside his own. Laruelle goes immeasurably further, telling us that given his model of the One it is useless to make distinctions among the blur of philosophies melting Hegel and Heidegger together with Nietzsche, Deleuze, and Derrida. Nor is he merely belittling this relatively recent list of names: all philosophy, he says, falls into "decision" while overlooking the immanent One that is obvious to everyone but philosophers. Nor is Laruelle always polite in this claim. Shifting from the tone of a mystic to that of a misanthropic Lex Luthor or Grand Moff Tarkin, Laruelle refers to past philosophers as "larvae," whose "hesitations . . . stumblings . . . skiddings" are designed "to prove to themselves that they still exist when in truth they exist only as fleeting larvae on the earth." (179) If there is a more bizarre passage in recent philosophy, or a more twisted sentiment, it is unknown to me. But even arrogance is forgiven when it comes from the great illuminators. And here we reach the third and most serious obstacle to the reception of Laruelle's work. For it is not at all clear that his central insight is of value. First, it can be questioned whether we really have a direct experience of the One at all -- yet this is the whole foundation of Laruelle's often extreme claims. Second, he gives no proof for the assertion that his is a different sense of the One from that of the neo-Platonic philosophers. And finally, even if Laruelle can handle these objections: so what? What good would it do to install an opposition between the One as a unilateral "determination in the last instance" and the cosmos of difference where the "larvae" become entangled in their pointless games? Laruelle's One is not the night, but the daylight in which all cows are black. And that, ladies and gentlemen, is how to conclude a book review! UPDATE [15 Aug 11 am CDT]: A strong critique of Harman's reivew by Anthony Paul Smith is here. 1. Police will be given discretion to remove face masks from people on the street. 2. The government would work with the police to stop people communicating via social websites. 3. The army could be used for guarding duties. 4. Last but not least: Curfew! And no, this isn't China, it's England! What's going on then? For Cameron, "young people smashing windows and stealing televisions is not about inequality", so he was eager to dismiss "phoney human rights concerns". At least he's being sincere on this regard. The official explanation: some opportunistic criminals are taking advantage of a peaceful protest. But I find this hard to believe. Perhaps Ken Livingstone, Labour's mayoral candidate, is right when he affirms that "the economic stagnation and cuts being imposed by the Tory government inevitably create social division." Perhaps, like Jenny Jones (the Green party's candidate for London mayor and a member of the Metropolitan police authority) just said, "the government must take some of the blame for what went wrong last night. Cuts in local services, especially youth services, played a role in fomenting tensions." So there might be a link between the riots and social inequality, but the government tries to separate any relation whatsoever that could render a global account of what's going on in England. I don't know who is willing to buy such a simplistic explanation that does not account for the destruction of social security in England for the last thirty years but I find it unsatisfactory and hypocritical. Now that’s one important way to implement the policy of indoctrination of the young. People who are in a debt trap have very few options. Now that is true of social control generally; that is also a regular feature of international policy — those of you who study the IMF and the World Bank and others are well aware. As the Mexico-California example illustrates, the reasons for conscious destruction of the greatest public education system in the world are not economic. Economist Doug Henwood points out that it would be quite easy to make higher education completely free. In the U.S., it accounts for less than 2 percent of gross domestic product. The personal share of about 1 percent of gross domestic product is a third of the income of the richest 10,000 households. That’s the same as three months of Pentagon spending. It’s less than four months of wasted administrative costs of the privatized healthcare system, which is an international scandal. [The US health care system is] about twice the per capita cost of comparable countries, has some of the worst outcomes, and in fact it’s the basis for the famous deficit. If the U.S. had the same kind of healthcare system as other industrial countries, not only would there be no deficit, but there would be a surplus. However, to introduce these facts into an electoral campaign would be suicidally insane, Henwood points out. Now he’s correct. In a democracy where elections are essentially bought by concentrations of private capital, it doesn’t matter what the public wants. The public has actually been in favor of that for a long of time, but they are irrelevant in a properly run democracy. Is this true of philosophy, too? We are so active now at NewApps that even ongoing discussions may disappear from the front page. For example, there is a terrific, high quality discussion going on about the proper relationship between metaphysics, physics, and the philosophy of physics (broadly construed) in one of our ongoing threads. Check it out! Yesterday, we published an Open Letter from the Chair and various other folk in the philosophy department at The University of Oregon . It should be obvious that at NewApps we don't endorse open letters we publish. In this case I feel sad for the philosophers at UO because it seems pretty obvious from afar that it is not a very happy place. As one of the commentators on the thread puts it there appears to be "significant conflict between the two main feminist scholars in the department." Meanwhile, we have learned that the proxy 'feminist philosopher= good judgment about survey methodology' or 'feminist philosopher = good judgment about what counts as excusable locally' can be unreliable sometimes. Even so, we have also learned that the discipline contains one high profile philosophical feminist, Carla Fehr, who is one of the world experts on the advancement and retaining of women in the sciences. Shouldn't the APA show some leadership and join with Prof. Fehr to put together high quality measures (including properly conducted surveys, and follow up proposals). If no money is available, perhaps the APA should apply for grants. So, there is indeed much to complain about the design and execution of the Pluralist Guide's Climate Survey. Moreover, matters have not been helped by the unresponsiveness by its authors to the serious concerns voiced by the philosophic profession. But as we are learning philosophers are human beings, too. [Disclosure: Linda Alcoff is a former colleague and professional mentor, whom I value greatly.] As a reminder, after months of extremely detailed criticism, the General Editors at Synthese never owned up to bending to Plantinga's lobbying or allowing their words to be used to slander Prof. Forrest in the pages of Synthese (by that philosophical imposture, Beckwith). So, while the climate section of the Pluralist Guide should be removed, I don't think the idea should be dropped. (As noted above: I prefer that the APA empower Fehr to do this right!) Such a climate section provides an incentive for folk to try to get their house in order. Lucky are those that work in a profession where reputation matters! I had my team with me but the pups had a mini entourage of their own, of course! And why wouldn’t they? It was a big shoot and even my entourage had an entourage—my stylist had an assistant, my security had extra security [for another version, see this]. Merely having an entourage, of course, is already indicative of fame. I’ve never had even the smallest entourage, and I would guess that most philosophers are below the threshold. Susan Sontag, who I sat next to on a panel once, had a small entourage to sweep her away to the next event. But intellectuals by and large just don’t seem to need them. Divas, on the other hand, do. Likewise Presidents—the Secret Service is an entourage all by itself. Or Roger Ailes, head of Fox news, who in public is constantly “buffered” by an “elaborate private security detail” paid for by News Corp. I’ll bet that like Mariah Carey’s, his security too has security of its own. A better measure of your fame and (self-)importance will take account not merely of the size of your entourage, but of its depth. On this basis we would expect the little people—those who have no entourage—to be assigned an index of 0. If you’re like Paula Abdul and all you can muster is a first-order entourage, your index ought to be 1. Mariah Carey’s index, on the occasion mentioned above, will have been in the neighborhood of 2. One complication emerges as we consider the elaborate arrangements around Presidents, Queens, Miss America, Dr. Evil and the like. The collection of entourages surrounding a celebrity, ordered by the “belongs to the immediate entourage of” relation, will be, in favorable cases, a directed rooted tree, that is a directed graph with a designated node such that between that node and any other node there is exactly one path (loops would indicate problems with the command stucture). 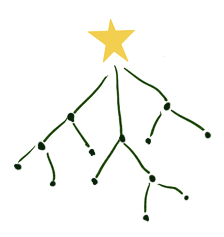 In the tree of entourages all paths lead to the Star at its root (which in the drawing below is at the top, not the bottom, in keeping with the power relations being represented). In the tree above (all edges are understood to be directed upwards), the longest paths contain three entourages, but there are also paths containing only two. How, then, should the ENTOURAGE DEPTH INDEX be defined? An important person has a large entourage, of course, but also, one would think, a deep one. Largeness corresponds to breadth, to the average number of nodes at each level (a “level” is the collection of nodes at a given distance from the root); overall depth to some measure where we give greater weight to nodes that are farther away from the top. (If you set the EDI simply to the length of the longest path, then you’re ignoring breadth altogether.) I’m not sure there is a universal measure: after all, in some contexts, breadth would indicate importance better than depth, and in others vice versa. Criminal organizations tend toward flatness, armies and administrations toward depth. The examples of Mariah Carey and Roger Ailes suggest another index, the SDI or Security Depth Index. But I suspect that, as the story about Roger Ailes implies, the SDI would not be a measure of importance so much as of paranoia. The late George Carlin has observed that some of our stuff has stuff of its own. So in addition to the EDI and the SDI, there may also be occasion to use, in an advanced civilization like our own, an SSI or Stuff’s Stuff Index. My computer has accessories, some of which, like the printer, have accessories of their own. If you count bare stuff as 1, that would yield an SSI of 3. Has anyone got an example of fourth-order stuff? We have been asked to publish this Open Letter. Comments are open here and can also be sent directly to Ted Toadvine, Department Head (email). It has come to our attention that false and misleading allegations about the Department of Philosophy at the University of Oregon have been circulated on various blogs, and we are writing with the intention of correcting this misinformation. Concerning (1), an administrative review was conducted by our Office of Affirmative Action and Equal Opportunity (OAAEO) in response to concerns brought forward by a now-retired member of the faculty regarding a current member of the faculty. The concerns were that the faculty member in question had violated the university’s policies concerning conflict of interest and sexual harassment. After a thorough review of the allegations, including interviews with two dozen students, some faculty members, and alumni, our administration concluded that there was insufficient evidence to conclude that there were policy violations as alleged. The announcement of the conclusion of this administrative review was made on 3 August 2011 by the University’s Senior Vice Provost for Academic Affairs. Prior to that time, no authoritative information concerning the review had been made public. Since Oregon administrative rules restrict public dissemination of information about personnel reviews, the details of this review are not public knowledge and have not been shared with faculty or students in our department. Concerning (2), the claim that this review was instigated by graduate students, or that the department and administration did not respond in a timely way to the allegations, is false. The administrative review was requested by the department head in response to concerns raised by a faculty member. Graduate students learned only later that the review was in process, in many cases as a consequence of being interviewed as part of the review. Since the review process is confidential and intended to protect due process, many of our graduate students expressed frustration at the lack of public information. Unfortunately, the confidential nature of the review process has encouraged some to believe that the administration has not responded appropriately. In our view, the confidential process of such reviews is essential to protecting the privacy of those who bring concerns forward, those who are accused, and those who provide information or evidence concerning the allegations. Concerning (3), the claim that a faculty member in our department “urged quiet about this incident” is false and misleading. Since personnel reviews are not a public matter, no public announcement or other authoritative information was disseminated to faculty or students concerning this review while it was underway. The majority of our faculty first learned of the review when graduate students expressed frustration about the lack of public information or administrative response. At that point, our department was asked by the administration to cooperate with the review process by respecting confidentiality and due process. Due process requires that hearsay and unverified allegations not become the basis for public judgment. In this spirit, many members of our department urged that the review process be allowed to take its course, so that unverified allegations not be taken as the basis for public condemnation. Unfortunately, the blog postings to which we are responding did not respect this request. All faculty, staff, and graduate students in our department were invited (on 2 May 2011) to comment directly and confidentially to a representative of SWIP-UK concerning the department’s nomination for their “women-friendliness” award. Although many graduate students were aware of the ongoing review at that point, either by being interviewed or by way of rumor, the majority of the faculty were not. When faculty members did learn of the review, they expressed the need to respect the due process of those involved. The department also organized an informational meeting between the graduate students and representatives of the administration and OAAEO, as well as holding a department-wide meeting to increase understanding about the review process and formulate next steps for our response as a community. No faculty member made any effort to suppress information for the purpose of winning an award. Our department takes seriously the task of fostering a positive climate for all members of our community. Our dedication to feminism and to philosophical pluralism is reflected in our academic curriculum as well as our department culture. The latest NRC assessment of research doctorate programs ranked us as the most diverse philosophy program among public AAU institutions, and the third most diverse program in the country. We are also the only philosophy doctoral program in the United States to require that students complete courses in feminist philosophy. As a department, we are committed to the safety of our women students, to fostering an environment that is healthy and appropriate between faculty and students, and to encouraging the flourishing of all women in our community, faculty as well as students. Although the administrative review is now complete, we take the recent events in our department as an invitation to work energetically and proactively toward improving the climate for women in our community even further. SCRANTON, Pa. — A longtime northeastern Pennsylvania judge was ordered to spend nearly three decades in prison for his role in a massive juvenile justice bribery scandal that prompted the state's high court to toss thousands of convictions. Former Luzerne County Judge Mark Ciavarella Jr. was sentenced Thursday to 28 years in federal prison for taking $1 million in bribes from the builder of a pair of juvenile detention centers in a case that became known as "kids for cash." Ciavarella was motionless when the decision was announced and had no reaction. From behind him, where family members of some of the children he sentenced sat, someone cried out "Woo hoo!"